Canada's foreign affairs minister says the federal government is willing to look at further reshaping the retaliatory tariffs list meant to counter U.S. duties. Chrystia Freeland told The House that if companies still have reservations about the list, they should contact the government to share those concerns. "We're happy to consider new issues," she said. On Friday, the federal government unveiled an updated list of U.S. products that are about to be slapped with tariffs while promising to spend up to $2 billion to protect jobs in the steel and aluminum sectors on this side of the border in the wake of a burgeoning trade war with the U.S. While much of the list resembled the original one released at the end of May, the government added some items like cast-iron grills, refrigerator-freezers and pillows to the list and removed others, like steel, iron beer kegs and prepared mustard. The tariffs will go into effect Sunday, backed by a substantial amount of industry and consumer support. "I think it's important that Canada follow through with these tariffs, because there is no justification for what the Trump administration has said about Canada," Leo Gerard, president of the United Steelworkers labour union, told The House. Gerard explained while he supports U.S. tariffs on steel and aluminum, they should never have been applied to Canada. Other nations, like China, South Korea, and Mexico "cheat like crazy," he added, and that's who Americans should focus tariffs on. But the way things stand right now, the workers will likely be the ones to suffer. "I think it's important that workers don't bear the brunt of these stupid internal fights," he said. The United States imported 26.9 million tonnes of steel in 2017, and more than four million, or 16 per cent of it, came from Canada. 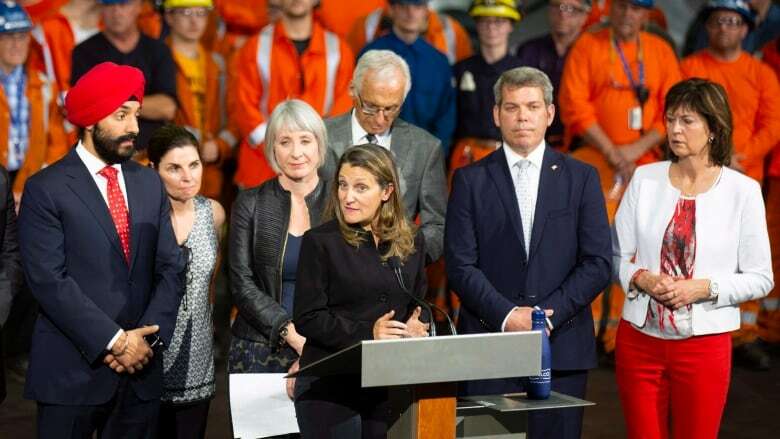 Freeland said the government has endeavoured to shape the tariffs to put as little pressure on Canadian industries as possible — including crafting the list to make sure there are Canadian and non-U.S. alternatives available. "I'm very confident that Canadians understand why we're doing this," she said. "I hope that Canadians will be really proud to do their part." Buying Canadian products is what former British Columbia Premier Christy Clark wants to see more of, because with this U.S. administration "if you do nothing you get punished, if you do something you get punished." While premier, Clark proposed banning shipments of thermal coal from the U.S. through B.C. because of American tariffs on softwood lumber. Now, she's calling on provinces to get on board with inter-provincial trade to support the Canadian economy. "Provinces need to step up and be part of the solution," she said. The entire situation isn't ideal, Freeland said, and tariffs are coming in as a last resort. "We think it should end tomorrow," she said. "Absurd things, especially in the economy, it's not sustainable."